Yesterday morning, I walked into the office, the boss told me a client’s Exchange was running slowly and they had had a Veeam backup fail. I know this client well enough to know if it was something simple he would have fixed it himself, so while my laptop booted I armed myself with a coffee. By the time I got on remotely, Ben on the help desk had also got online and was giving me the heads up on what the NAble proactive system had flagged up during the night, one drive was practically full, and it had filled up quickly. I rang the client who told me the drive in question was the transaction log volume for Exchange, (which with failing backups would make sense). Also he had added 1500 iPad clients to the network in the last few weeks, and the transaction logs were going up by about 20GB a day. Without a good backup to flush the logs things had steadily got worse. I connected to the Veeam backup server and this was the error. If you look in the Event Log you will probably also see Event ID 2007. 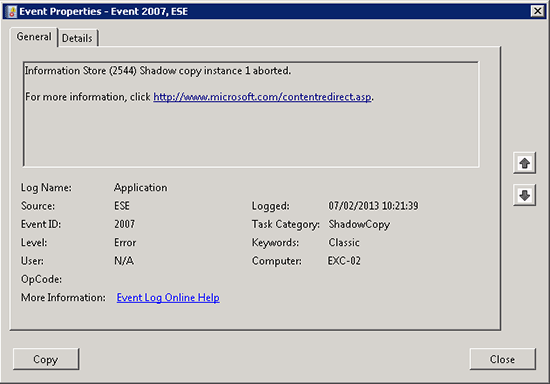 Information Store (2544) Shadow copy instance 1 aborted. 2. 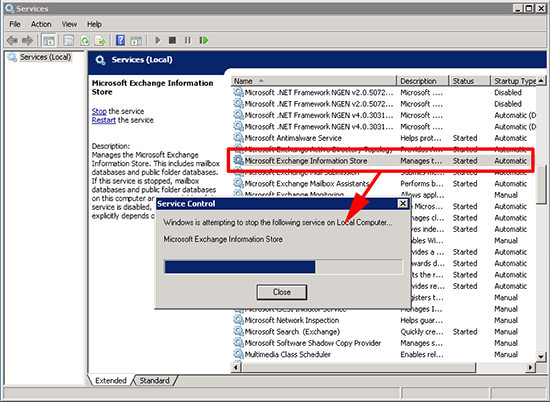 To fix that you need to restart the Microsoft Exchange information store service. 3. Check again to make sure you are back up. 4. 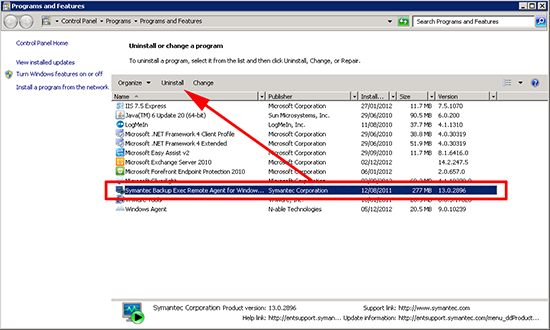 Note: We are backing up using Veeam, make sure there is no instance of the Symantec Backup Exec Remote Agent for Exchange, if it’s there remove it. 5. Finally, I’ve got over 120GB of transaction logs to contend with, for the problem mail store, I’m going to enable circular logging to free up some room. (Note: You can disable this again once you have a decent backup if you wish). 6. 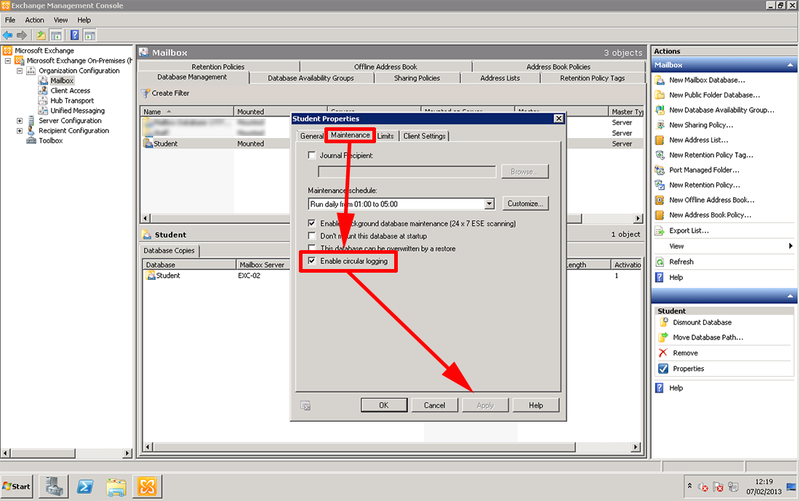 At this point I rebooted both the Exchange server and the Veeam Backup server it then performed a backup of the Exchange server without error. 1. Exchange shouldn’t be more than 20 sec. 2. Please make sure that Exchange server isn’t running on a snapshot. 3. Troubleshoot the VSS service. i.e. Check the writers state. Probably there will be a Failed/Timed out writer. 4. To get a failed writer to a normal state restart following services: “COM+ Event System”, “Microsoft Software Shadow Copy Provider”, “Volume Shadow Copy”. 5. 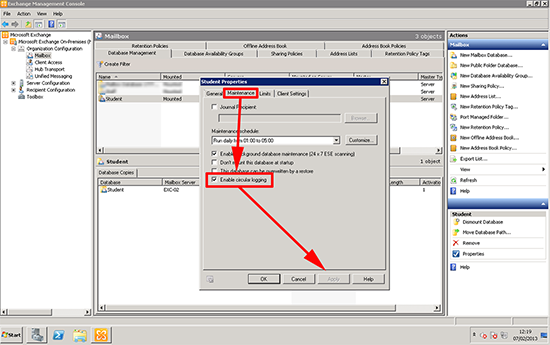 Next you can manually create a shadow copy of an Exchange db volume: (Note: This assumes Exchange is on C:). 6. Manual creation should report that is completed successfully. 7. Delete the shadow copy that you have just created.